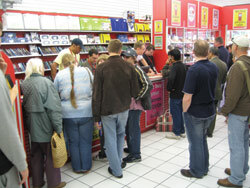 'My launch day was amazing,' enthuses CeX (Complete entertainment Exchange) franchisee Stephen Boult. 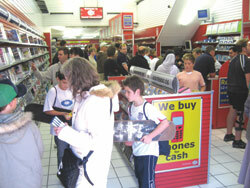 'It was so successful, we were even competing with the established CeX stores. We ended up in the top end of the table for turnover on our first day and our first week smashed our budgeted turnover. Self-confessed gadget fanatic Stephen first heard of the CeX concept when his wife became the company's Finance Director. 'When I visited one of their shops, I have to say I was completely hooked - I loved the idea,' he reveals. 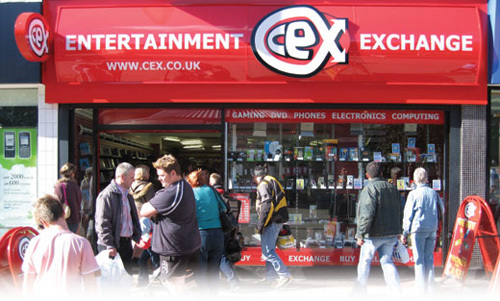 CeX is the one-stop-shop for gadget lovers. In the fast and ever developing world of high-end electronic entertainment, CeX provides a valuable service to technology enthusiasts wishing to stay ahead of the game. The business model involves the buying and selling of quality second-hand technology and entertainment products. The ongoing development of mobile phones, MP3 players, digital cameras, computers and games consoles means models are quickly updated and replaced. CeX has widened these growing markets by giving customers the choice to buy second-hand goods with a 12-month warranty at attractive prices and the ability to exchange their unwanted goods for cash or something they do want. Founded in 1992, CeX is now embarking on a nationwide franchise development programme and is aiming to achieve national coverage within five years. The company is searching for energetic and enthusiastic business-minded people who want to operate in a dynamic, fast-paced business that's driven by consumer demand. Hoping that his shop will be his first of many, Stephen reveals that he is head down, working hard and is looking forward to building his business. Helping him with this development is the CeX marketing team led by Jon Cronin. 'They're very proactive,' states Stephen. 'Jon has spent a couple of days working from my shop since we opened, helping me tweak and improve the marketing aspects of the business. Nothing within reason is too much trouble for CeX as long as you're the sort of person who is dedicated and prepared to fully commit themselves to the concept.